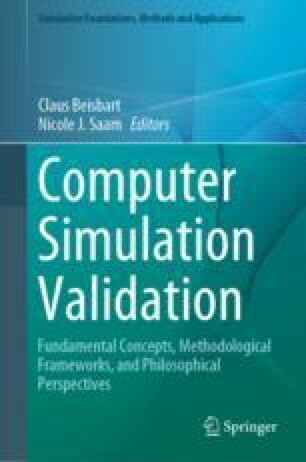 This chapter examines the role of parameter calibration in the confirmation and validation of complex computer simulation models. I examine the question to what extent calibration data can confirm or validate the calibrated model, focusing in particular on Bayesian approaches to confirmation. I distinguish several different Bayesian approaches to confirmation and argue that complex simulation models exhibit a predictivist effect: Complex computer simulation models constitute a case in which predictive success, as opposed to the mere accommodation of evidence, provides a more stringent test of the model. Data used in tuning do not validate or confirm a model to the same extent as data successfully predicted by the model do. Box, G. E. P. (1979). Robustness in the strategy of scientific model building. In R. L. Launer & G. N. Wilkinson (Eds. ), Robustness in Statistics (pp. 201–36). Academic Press. https://www.sciencedirect.com/science/article/pii/B9780124381506500182. Garber, D. (1983). Old evidence and logical omniscience in Bayesian confirmation theory. http://conservancy.umn.edu/handle/11299/185350. Intergovernmental Panel on Climate Change, ed. (2014). Evaluation of climate models. In Climate Change 2013—The Physical Science Basis (pp. 741–866). Cambridge: Cambridge University Press. http://ebooks.cambridge.org/ref/id/CBO9781107415324A028. Steele, K., & Charlotte, W. (2016). Model-selection theory: The need for a more nuanced picture of use-novelty and double-counting. The British Journal for the Philosophy of Science. https://doi.org/10.1093/bjps/axw024.